Your volunteer looks like a sunflower. I leave up the sunflowers for the birds and they scatter the seed and I have volunteers every year. Echinacea have been going strong all summer and I have them in a vase again. Even those that are fading look great in vases and last a long time. Thanks for the ID Donna, I thought sunflower also but all those composites look similar to me. Echinacea ‘white swan’ is an elegant flower, I really like the pairing too of Sedum ‘Autumn joy’ with Salvia ‘Blue Sky’ and especially love to see Butterflies enjoying late summer flowers. The young green of the sedum is something I really enjoy. Hope to get more butterflies but so far this year they have been scarce. 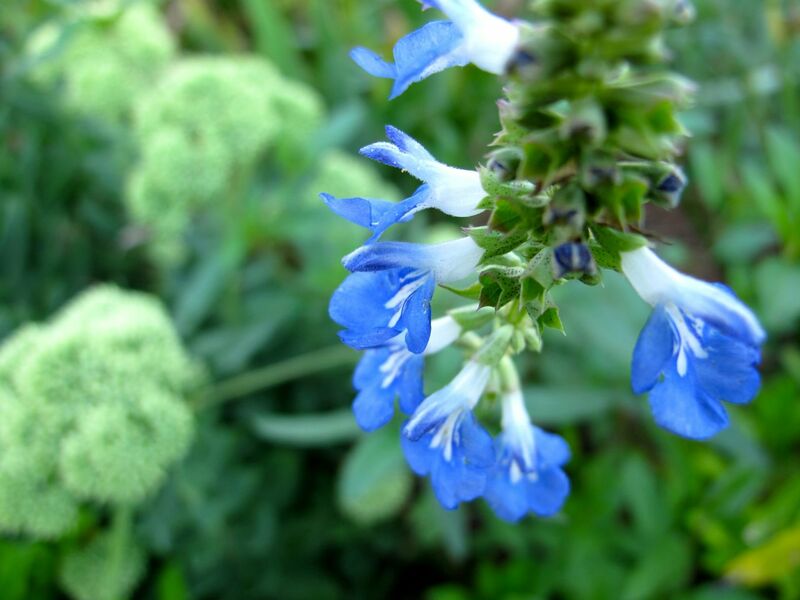 I love that Salvia ‘Black and Blue’. Not fully hardy in the UK, but on looking it up I find it is also huge! It must make a real statement in your garden. 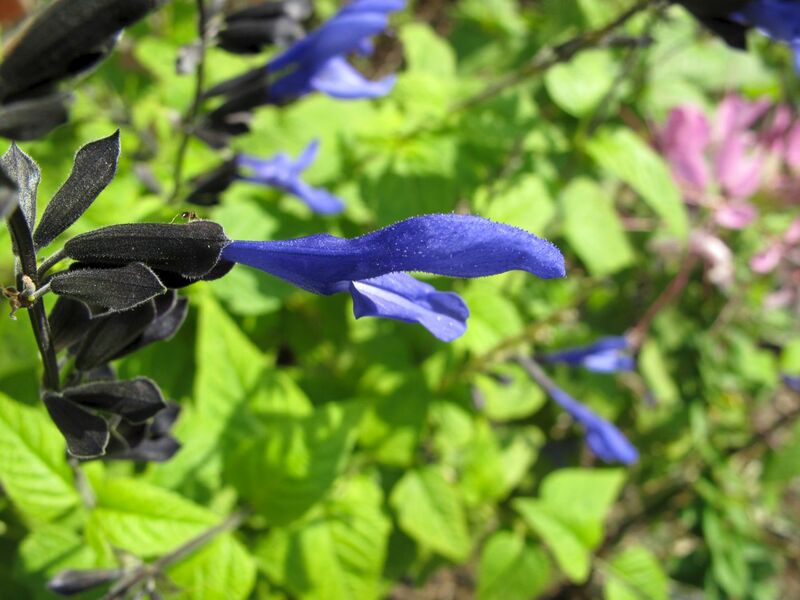 Salvia ‘Black and Blue’ grows to 36 inches tall, but it has not formed very large clumps in my garden. Supposedly in five years it can spread to be 6 feet wide, but not mine. Beautiful. I hope to be able to see your garden someday. Thanks John. That would be great and I, yours. My won’t be decent until next spring though! 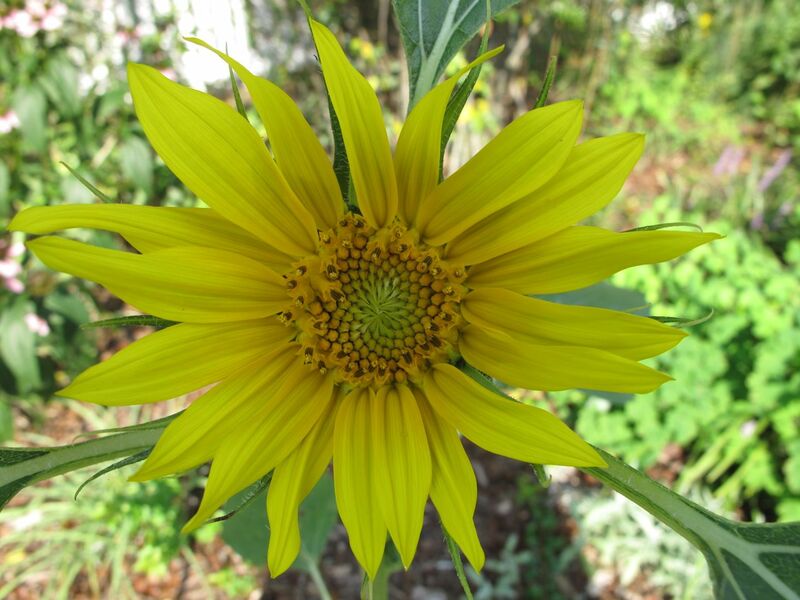 I have some volunteer birdfeeder sunflowers in odd places too. I let them be since it’s food for so many. Too funny about the dahlia. It does look like it’ll be pretty though. Glad you’re having some rain finally. Thanks Stephi. The blue dahlia would have been nice but this one is a good strong color too. After a bit of a respite, we’re in for very high temperatures and humidity this coming week. ‘White Swan’ is a beautiful echinacea, one of the few echinacea hybrids I like. 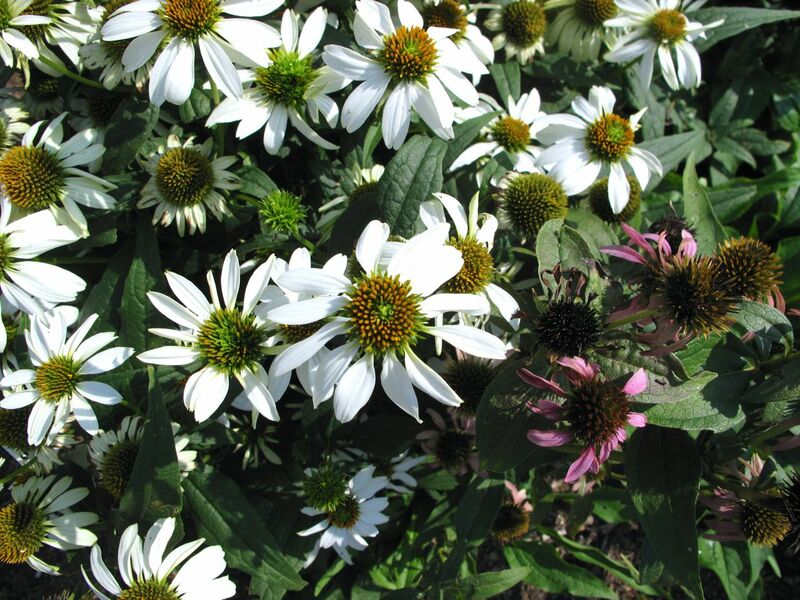 I agree, so many of the echinacea hybrids seem way over-engineered. What the rain can do! I was like Salvia ‘Black and Blue’ whenever I see it, I must make more effort to find a plant, I think it would do well here. 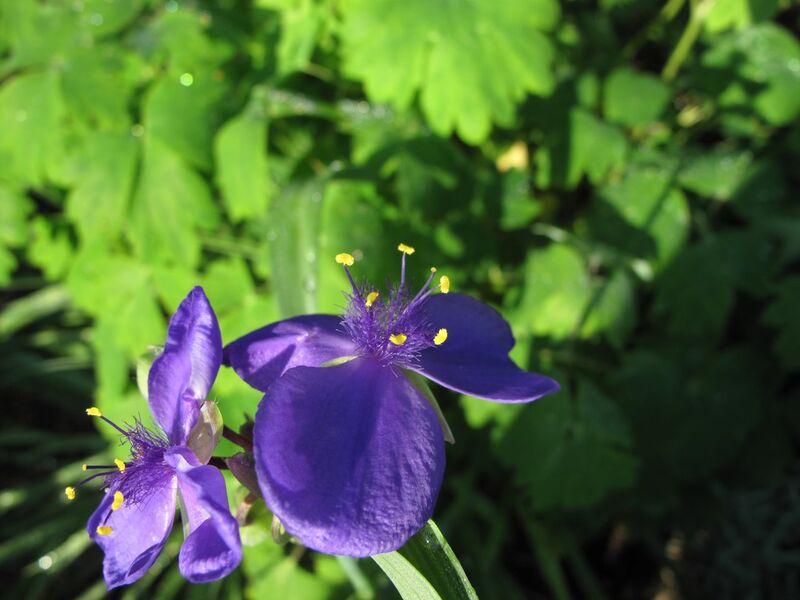 I have ‘Indigo Spires’ which I think would good be a good addition for you. Thanks for recommending ‘Indigo Spires’ for my garden. I looked it up and I do love it already. 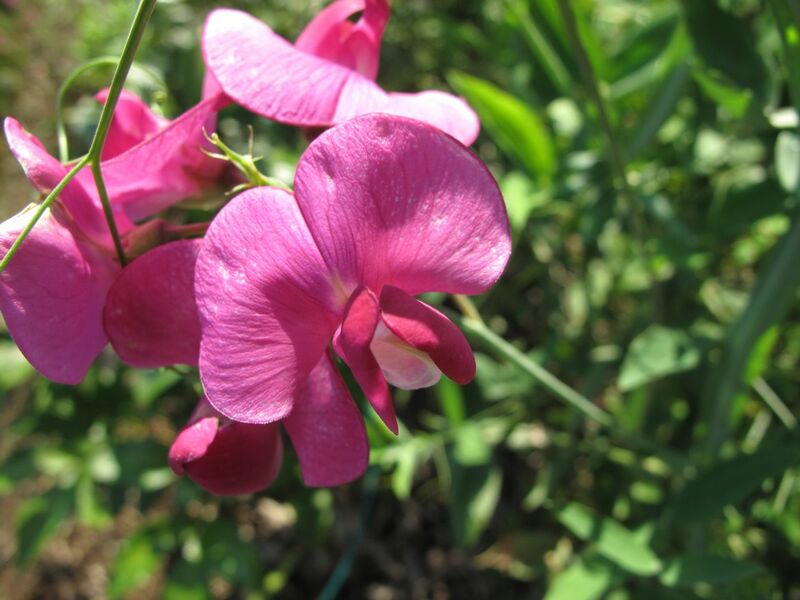 It needs winter protection in my growing zone, but I will look for it and give it a try. ‘Black and Blue’ might do better for you than it does here. 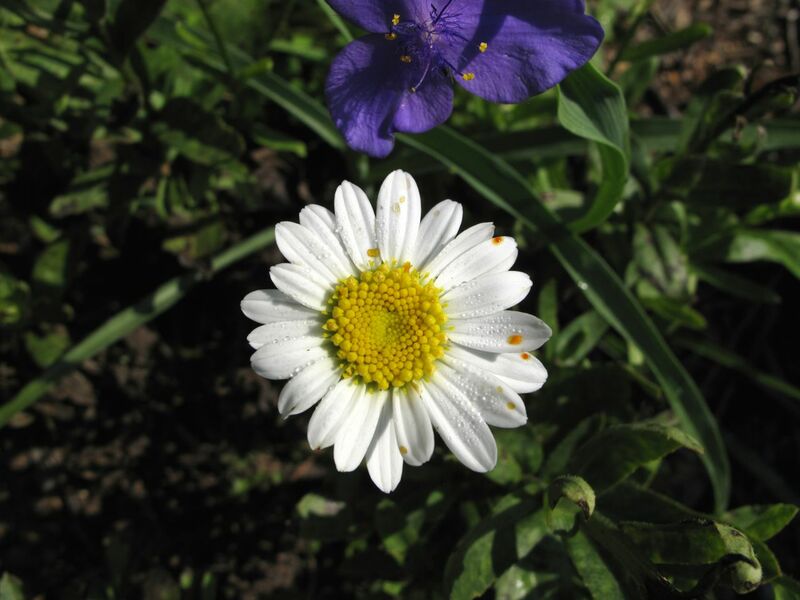 Judy, White Swan has a nice, refined look and does sport a lot of blooms. It would be a good choice. I love the blues of those salvias. Ann, I do too. Blue flowers just seem so special. Your Echinaceae and Salvias are beautiful. I have just started to plant Salvias, but will need to take cuttings to increase my numbers. I keep getting a rash on my arms and hands when I garden, such a nuisance, I should wear gloves and long sleeves, but in the heat of summer it was too much! Thanks Pauline. You have such an extensive collection of plants to enjoy, but I think you’ll like the Salivas too. There are so many different ones to choose from. 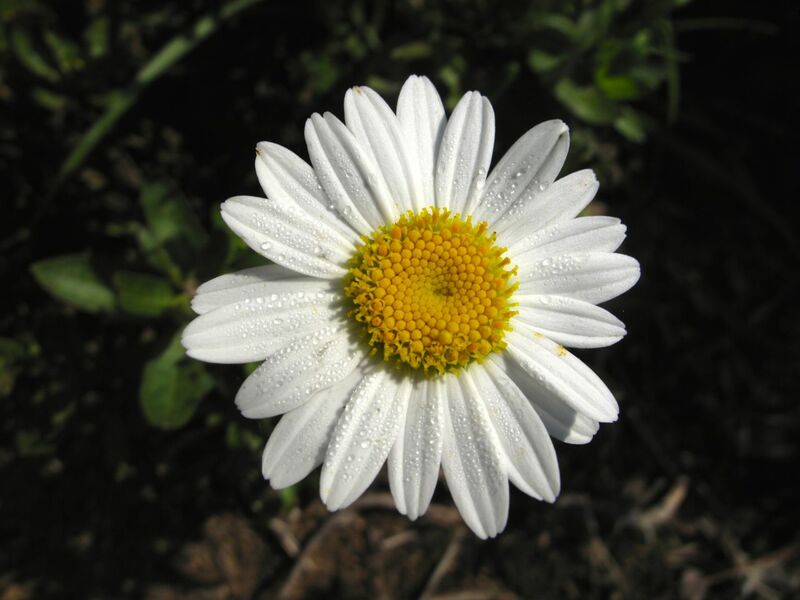 I also lost my love for Shasta daisies. They’re beautiful for a few days but there are just too many bugs in my garden to leave the pristine blooms alone. Last winter did the dirty work for me and they all died out. The Echinacea looks great and I’m tempted to try the perennial pea. … and I better check the forecast, a little warmer weather would still be nice. The shastas as you say, look good for a short time. I did successfully deadhead them this year and kept them going for a while, but then I just lost interest. Sorry, we’re getting your warmer weather here this week. I like your volunteer! Looks very similar to Helianthus Lemon Queen. Didn’t have much luck with S. uliginosa but it’s so pretty and one of the few true blues, maybe I should try again. Thanks Annette. Lemon Queen sounds familiar but I must have seen it in others’ gardens, don’t think I planted it here. It is a nice bloom though. How beautiful!!! 🙂 we are starting to have the cone flowers bloom, hope to take pictures soon. Thanks Michael. Will look forward to seeing your cone flowers. A little rain can really work wonders, and your flowers look happy! The white Echinacea is lovely, and I really love the blue salvia next to the sedum. Yes, I appreciate the rain so much more when it’s been absent for a while. I like that sedum in its early green stage. 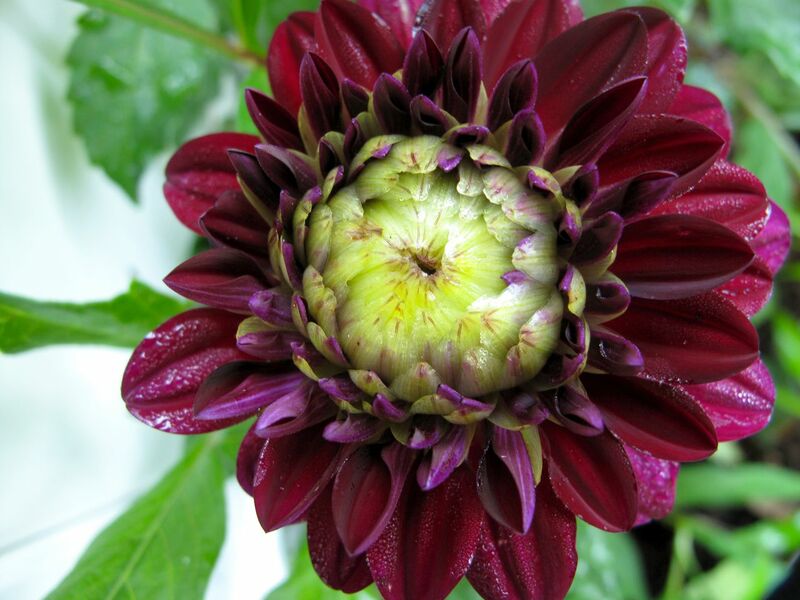 I’m impressed by that dahlia, Susie, even if its color is nothing like that shown on the package. The growers know we’re all suckers for blue and constantly try to lure us in by suggesting that their offerings are blue when they’re, at best, purple. This one looks closer to burgundy – is it? You’re right. Blue does it for me. This dahlia is definitely burgundy, a pretty color but not blue. 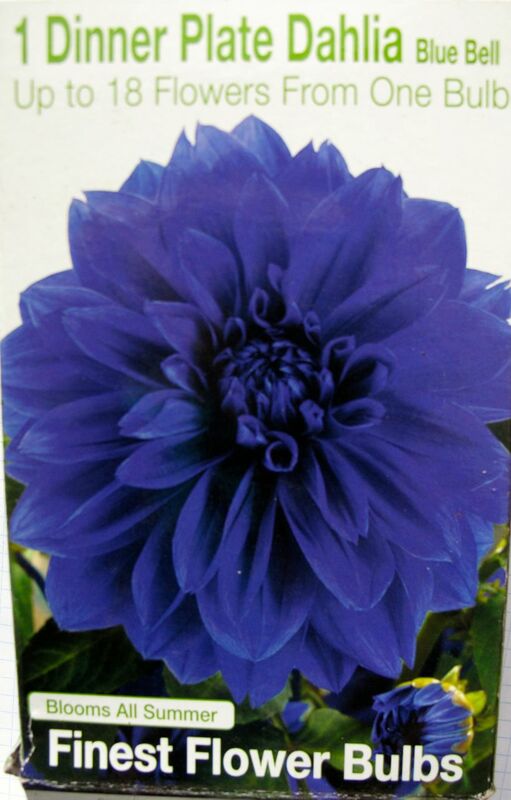 But have you ever seen a blue dahlia? I don’ t think there is such a thing. The colour on the packet was misleading. Still never mind you have a lovely dahlia. 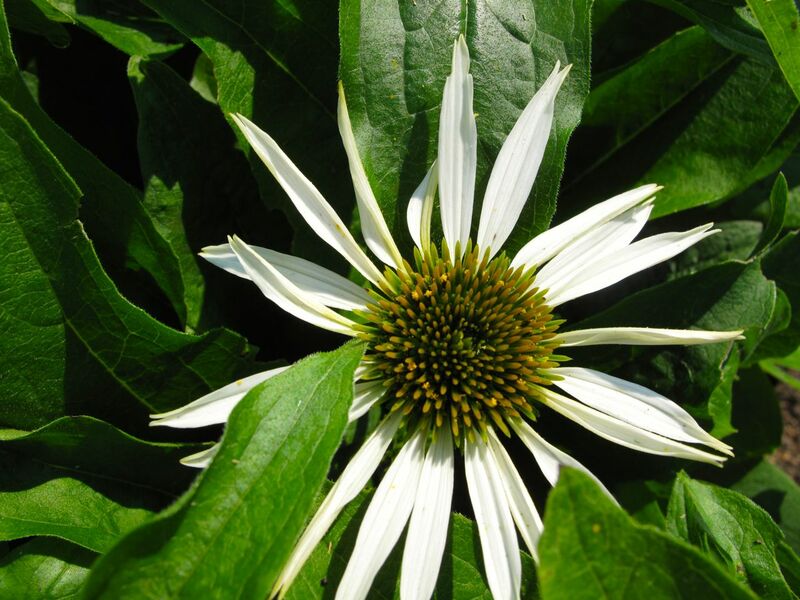 Echinacea White Swan is one of the few echinaceas that keep going here and seed around modestly. I love salvias, Salvia uliginosa is the only one which is hardy here but they are so easy from cuttings. Your Black and Blue is lovely.